Two elderly spinsters created this amazing dessert, now a world classic. Success depends on the apples (Cox is the very best, Braeburn second, then Granny Smith). You can cook this one day ahead, keep it in the mould and reheat in a preheated oven (150°C/300°F for 20 minutes), but it’s best one hour after cooking it when still warm. Pre-heat the oven to 190°C/375°F. On a floured surface roll out the puff pastry to 2mm thick; prick it all over with a fork. Transfer to a tray and refrigerate for 20-30 minutes to firm it up and prevent retraction while cooking. With a template cut a circle of 20cm/8in diameter and refrigerate on a lightly floured tray. Peel the apples and cut in half. Using a melon baller, scoop out the cores. Pour 20g/¾ oz water in a thick-bottomed saucepan (14-16cm/5-6in) and spoon sugar evenly, letting the water absorb the sugar. On a medium/strong heat, cook the sugar water to a syrup then to a golden brown caramel for 5-6 minutes (do not stir). Immediately add the cold diced butter, swirl the pan (be careful, there will be strong boiling). Pour into a round baking tin (18.5cm x 4-5cm/7 x 2in) deep and let the caramel firm up. Arrange 12 halves of apple upright around the edge of the mould to complete a full circle. Sit half an apple, flat side up, in the centre and top with another half apple. Cut the remaining apples into quarters and wedge them in the empty spaces as tightly as possible. You need to pack in as many apple pieces as you can into the mould as this will give the perfect density to the tarte - and the perfect slice. Melt the remaining 20g/¾oz of butter and brush over the apples. Sprinkle the remaining 30g/1oz of caster sugar over the top. Bake in the pre-heated oven for 35 minutes. Lift the tarte on to the work surface, place the puff pastry circle on top of the apples and tuck the edge of the pastry inside the mould. Cook for a further 30 minutes. Cool for 1 or 2 hours until barely warm. 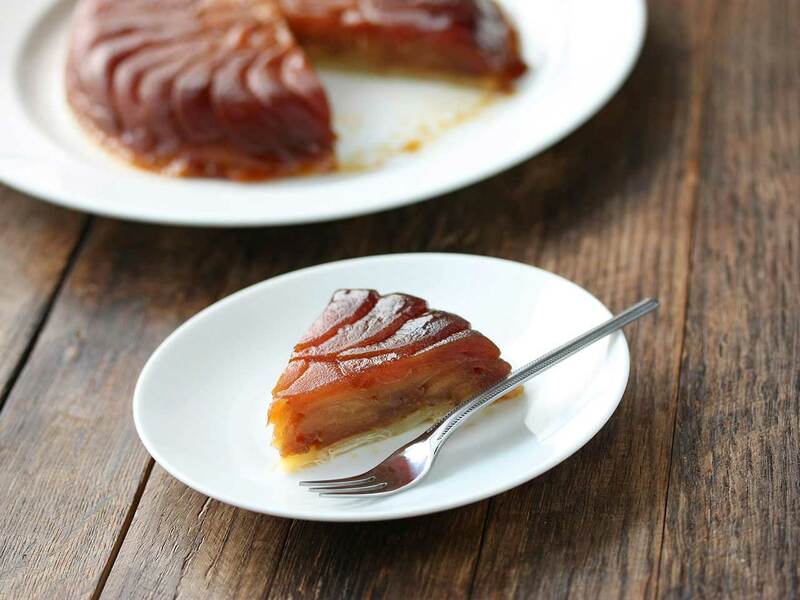 Slide the blade of a sharp knife full circle against the mould to release the tarte tatin. Place a large dinner plate over the tarte and turn upside down, shaking sideways to release.